Do I Need To Hire An Extra-Long Van (XLWB)? Extra-long wheelbase vans like the Mercedes Sprinter XWLB are usually the van of choice for couriers and transport firms - and carpet fitters who appreciate their impressive 4m-5m internal load length. These vans offer the longest load length available on goods vehicles under 3.5t that can be driven on a car licence. The Mercedes Sprinter has led this segment of the market for some years now, but another popular choice is the Ford Transit extended wheelbase. Both vehicles have an internal load length of more than 4m and a payload of around 1,000-1,200kg. The van's larger size reduces the available payload slightly, but for many users the extra load space makes this worthwhile, allowing an extremely wide variety of loads to be carried. Many hire companies offer extra-long vans, although if you need this specifically then check they are available. Some companies only offer standard long wheelbase (large) models, which are shorter. Have a look at our what size van? 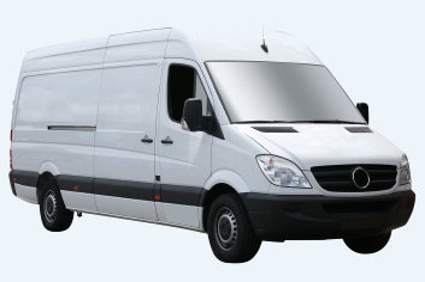 page to work out if this type of hire van is the right for you.